“Tai Chi Chuan, the great ultimate, strengthens the weak, raises the sick, invigorates the debilitated, and encourages the timid”. Tai Chi Chuan is a traditional Chinese martial art and is considered to be one of the three main soft, or internal, martial arts systems; the other two being Ba Gua and Xing Yi. 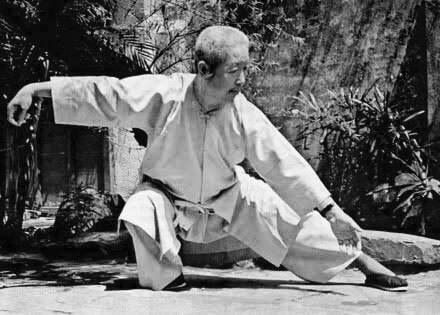 The particular variant of Tai Chi taught at ResilienceMT is the short Yang form, pioneered by Professor Cheng Man Ching (above). Tai Chi Chuan training emphasises the principles of relaxation, proper joint alignment, correct breathing and energy flow through the practice of the empty hand form, the sword form, and push-hands play. According to the classics, “When extreme yang encounters extreme yin, the yang will always be defeated.” Or as the Taoist sage Lao-Tzu put it, “The soft and pliable will defeat the hard and strong.” Hence, the Tai Chi exponent seeks not to contest with the opponent’s strength, but instead to relax, yield, and move in harmony with the opponent, leading the attacking force away so that it becomes ultimately useless. The first step in exploring this concept in Tai Chi practice is to give up the urge to win and achieve victory, or as The Professor puts it, “To learn Tai Chi Chuan, it is first necessary to learn to invest in loss.” This may sound like a peculiar idea, given the fast-paced hyper-competitive modern world that we all inhabit, however, the concept has great physical and psychological utility. Before you can learn to neutralise and move in harmony with an opponent’s force, you must first relax and give up the idea of victory. This will afford you an opportunity to first feel, and later understand the nature, movement and direction of this force. Only through this process of relaxation and not contending can you begin to feel and understand what is happening to your body and to that of your opponent’s. This will necessarily mean that, in the beginning, you will get pushed around a bit, loose balance, and sometimes get knocked over. However, this should not be viewed as a negative experience, as frustrating as it often is. Instead, it is an opportunity to learn, practice a little humility, and gain some useful experience and insight. There has never existed a person who, upon taking up the study of the martial arts, was not initially motivated by the desire to win and gain martial victory. However, as the Tai Chi practitioner learns to relax, breathe correctly, align the body, and move with grace and efficiency, the desire for victory soon begins to fade, allowing space for a more interesting physical/spiritual conversation to emerge, both within ourselves and with those around us. Is Tai Chi Chuan right for me? Tai Chi Chuan training is suitable for all ages and fitness levels and caters equally to serious practitioners as well as individuals seeking a unique way to relax, destress, and above all, have fun. Benefits of Tai Chi include improved circulation, balance, coordination, flexibility, mental clarity and relaxation. Tai Chi Chuan training is currently offered in personal training sessions, by appointment, for individuals or small groups (of up to 4 people). For specific fitness requirements and needs, contact Chris Gauntlett to find out more.